Trade union badges form a central part of the rich visual culture of the labour movement that also encompasses trade union banners, emblems and membership cards and other ephemera. 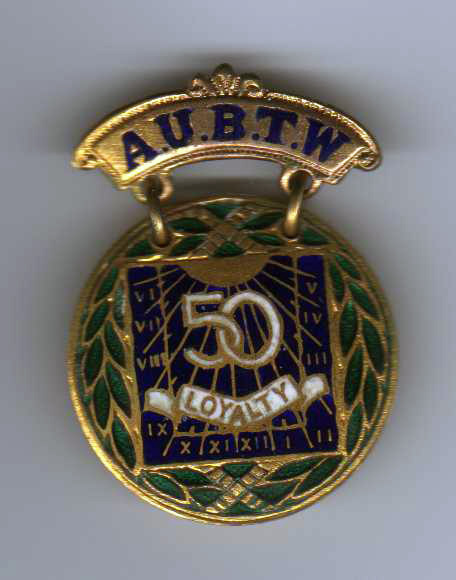 Often taking their design from aspects of the larger and more intricate union emblems of the 19th century, or illustrating the tools of the union member’s trade, badges were first produced by trade unions as far back as the 1870s, and by the 1890s were routinely being issued by some unions to new members. In the years since the miners’ strike of 1984-85, many hundreds if not thousands of new badges have been issued by trade unions, to promote the identity of new unions formed through mergers and amalgamations, to commemorate strikes and other key events, or simply to enable members to show their pride in their union membership. Probably the first trade union badge collector was Walter Southgate, who started collecting union ephemera as early as 1905, and would later become one of the founders of the National Museum of Labour History. The collecting tradition is kept alive today by the Trade Union Badge Collectors Society, a UK-based group set up by like-minded enthusiasts to promote a wider appreciation of trade union badges and ephemera, and to create a friendly environment for sharing information and research about trade union badges and ephemera. This website aims to provide a short introduction to trade union badge collecting and the work of the society. If you would like to join the Trade Union Badge Collectors Society, please download and complete the membership application form.